Covering nearly four acres and soaring 425 feet at its highest point, St. Peter’s Basilica is both a monument to the glory of God and a testament to the genius, ambition, and will of men. R. A. Scotti’s Basilica chronicles the epic construction effort behind this architectural treasure. Pope Julius II—who took both his name and his disposition from the Roman emperor—conceived St. Peter’s at the height of the Renaissance to replace Constantine’s fourth-century basilica. It was completed some 150 years later during the Baroque papacy of Alexander VII. Along the way, the printing press revolutionized mass communication, the Catholic Church was shaken by the twin earthquakes of the Reformation and the Counter-Reformation, and a vast New World was mapped across the Atlantic. Propelled by artistic inspiration, social upheaval, and political intrigue, the story spans two centuries and includes larger-than-life characters. R. A. Scotti has wanted to write Basilica since she was a student in Rome seeing St. Peter’s for the first time. She is the author of six previous books, including several espionage novels and, most recently, the best-selling Sudden Sea: The Great Hurricane of 1938. She lives in New York City with her family. The outrage sparked by the demolition of Constantine’s basilica to make way for the new St. Peter’s brings to mind modern battles between real estate developers and defenders of historic landmarks. And yet today, the “new” basilica is itself a historic treasure—one of the architectural marvels of the late Renaissance. To what degree do you believe a city’s architectural legacy should be preserved? Where do we draw the line between preserving the past and embracing the future? Before reading Basilica, how aware were you of Renaissance-era papal practices, such as the selling of indulgences and venal offices, or of the questionable moral character of the era’s popes? Does the Vatican’s checkered history affect your perception of the institution today? Scotti writes, “Religion is illusion . . . and the gleam of gold, the clouds of incense, . . . the sacred art and evocative music, create that illusion. Stripped bare of all but its dogma, it would be exponentially reduced.” Do you agree? 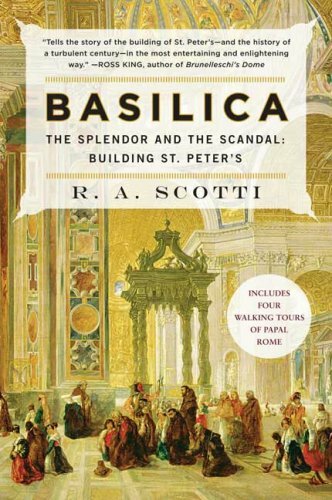 Scotti details the vast sums spent on the basilica at a time when most Catholics lived in abject poverty. Does this allocation of resources seem morally justifiable? Like many monumental structures of antiquity, St. Peter’s was built on a scale and with a level of craftsmanship that seems inconceivable today. Are there any architectural achievements of the last century that seem on par with the construction of St. Peter’s? Today, the Sistine Chapel ceiling is regarded as one of Michelangelo’s greatest achievements. But he saw the commission as a punishment—a distraction from what he considered his most important work: sculpting the tomb of Julius. Do you think Julius’s redirection of Michelangelo’s talent brought the artist to greater heights? Is there an argument to be made that artists, in general, create better work under direction? The book describes the many personal rivalries and animosities among the artists who worked on the basilica. Do you think the great artists of the Renaissance—or of any era—could have reached the same heights without this competitiveness? Of the many historic figures in Basilica—from Julius II to Raphael to Martin Luther—who would you most like to meet? If you could put a question to any one of them, what would it be?